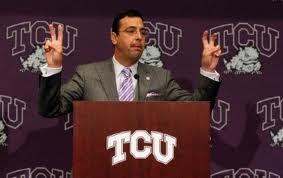 Texas Christian University's Athletic Director Chris Del Conte is shown here at a press conference discussing TCU's acceptance of an invitation for membership into The Big East Conference. Unless you are going for comic relief though, the Double-Victory Sign, is an emblem that should never be used - especially if you are in a leadership role. It has too strong of a negative conditioned-response trigger to Richard Nixon's resignation. Even if you weren't born when it happened, you probably have a very strong visual memory of this, either via photos or parody - a pose he struck just prior to embarking on Marine-One. Many a comedian have satirized the former President with this pose.